K-18 Karelia is a 2nd generation Project 667BDRM Delfin Nuclear-Powered Ballistic Missile Submarine. The submarine was laid down in February 1987 in Severodvinsk; launched in 1988; commissioned in 1989. The sub has performed over 14 missile firings and covered more than 140,000 nautical miles. In April 2000 Vladimir Putin sailed on board the sub. 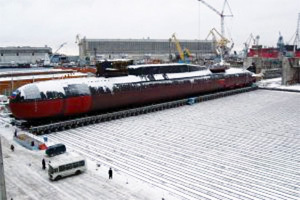 In 2004-2009 the submarine had been modernized at Zvezdochka shipyard. Over 100 innovations were applied during upgrade, including installation of rocket torpedo system TVR-671RTM and SLBMs RSM-54 Sineva. Reportedly, service life of upgraded submarine will make 10 years.